In 2010, the state of Wisconsin's motorsport options were limited as the Milwaukee Mile was unable to host their traditional major stock car and open wheel races due to financial difficulties. While the NASCAR Nationwide series has relocated to nearby Elkhart Lake's Road America, the IZOD INDYCAR series waited for the previous promoter issue to be resolved. Added back to the schedule for 2011, fans of the one-mile event (which often presided the week after the Indianapolis 500) rejoiced as open wheel racing returned after a 2010 season absence. Ending a horrible chapter for the fairgrounds that hosted auto racing since 1903, the IZOD INDYCAR series are back to the outskirts of Milwaukee to compete at the 1-mile oval in West Allis. Readying for a Sunday afternoon event, qualifying for The Milwaukee Mile 225 will have Target/Chip Ganassi Racing's Dario Franchitti starting at the front. Recording a two-lap average lap time 42.7766 seconds, Franchitti's average speed of 170.841 miles per hour was 2.5 miles per hour faster than Ryan Briscoe's 2009 pole run. 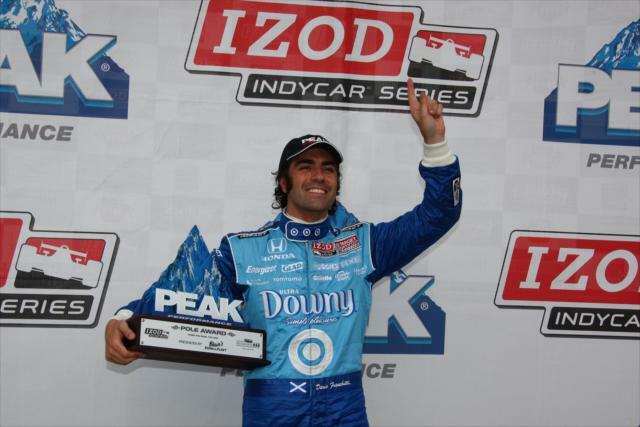 Alongside Dario Franchitti, the Target/Chip Ganassi Racing driver will have Helio Castroneves representing the initial best starting of top rival Penske Racing. The #9 car of Scott Dixon will be immediately following teammate Franchitti to the green flag. From 4th to 6th place will have the team cars of KV Racing Technology launching a best chance for the team to spoil as a victor. The #82 of Tony Kanaan leads over Takuma Sato and EJ Viso. While fast in practice, Penske Racing's Will Power struggled in qualifying Saturday afternoon. Following his first oval win at Texas Motor Speedway, Power's circle track luck took a turn with only a 17th fastest time after losing traction for just an instant on track. "We were flat through turns one and two but we had a big moment there in turn three when we got loose that cost us." With a 26-car field set to compete for The Milwaukee Mile 225, the HVM Racing team could be questionable for the race Sunday as driver Simona de Silvestro crashed on her warm-up lap in qualifying. Conscious after the accident, de Silvestro was taken off-site for further medical examination. The Milwaukee 225 will start Sunday at 3:30pm.